View of a 56 Kbp region of human chromosome 17 where GENCODE annotates one non-coding and 5 protein coding genes. Two genes in the region display tissue-specific gene expression as evidenced by GTEx RNA-seq. The TCAP (titin cap protein) is highly expressed in muscle tissue, while PP1R1B (a therapeutic target for neurologic disorders) shows expression in brain basal ganglia but not muscle. The GENCODE project produces high quality reference gene annotation and experimental validation for human and mouse genomes. 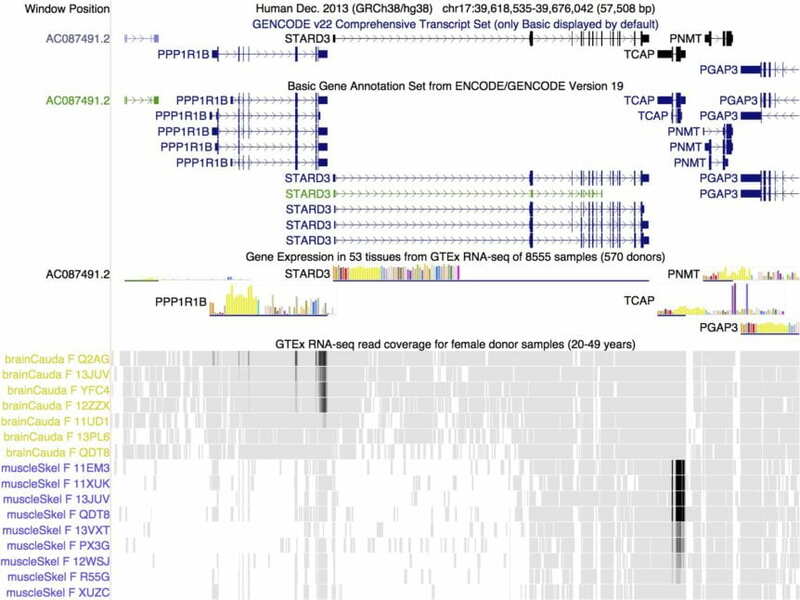 To continue to improve the coverage and accuracy of the GENCODE human gene set by enhancing and extending the annotation of all evidence-based gene features in the human genome at a high accuracy, including protein-coding loci with alternatively splices variants, non-coding loci and pseudogenes. To create a mouse GENCODE gene set that includes protein- coding regions with associated alternative splice variants, non-coding loci which have transcript evidence, and pseudogenes. The mouse annotation data will allow comparative studies between human and mouse and likely improve annotation quality in both genomes. The process to create this annotation involves manual curation, different computational analysis and targeted experimental approaches. Putative loci can be verified by wet-lab experiments and computational predictions will be analysed manually. The human GENCODE resource will continue to be available to the research community with quarterly releases of Ensembl genome browser (mouse data will be made available with every other release), while the UCSC genome browser will continue to present the current release of the GENCODE gene set. The process to create this annotation involves manual curation, different computational analysis and targeted experimental approaches. Putative loci can be verified by wet-lab experiments and computational predictions will be analysed manually. The Computational Genomics Lab, working with the wider consortium, is creating algorithms and software essential for finding and weighing the evidence for genes and isoforms.